The suicide bombing at a May 22 concert in Manchester and the June 3 attacks at the London Bridge in England reportedly carried out by sympathizers of the reactionary fundamentalist Islamic State (ISIS) were unconscionable and horrific. They attracted wall-to-wall coverage, humanizing the victims in the U.S. bourgeois media. During this same period, the U.S. imperialists have escalated their bombing attacks in Syria and Iraq, killing hundreds of civilians, terrorizing many thousands more, and fueling reactionary Islamic fundamentalism. On May 31 alone, U.S. airstrikes killed between 50 and 80 civilians in Mosul, Iraq. Horrendous attacks were also being carried out by reactionary Islamic fundamentalist and jihadist forces against the people in Syria, Iraq, Afghanistan, and other countries across the Middle East. Mosul, Iraq—Hundreds, probably thousands, of civilians have been killed by U.S. airstrikes and ISIS attacks as these reactionary forces battle for control of Mosul. Since late January, over 100,000 have fled the city. Across the region, U.S. attacks and the slaughter of civilians are escalating under the Trump/Pence regime. On May 25-26, over 100 civilians, including 42 children—were massacred by U.S. airstrikes in the town of Al Mayadeen in Eastern Syria, then reportedly under ISIS control. 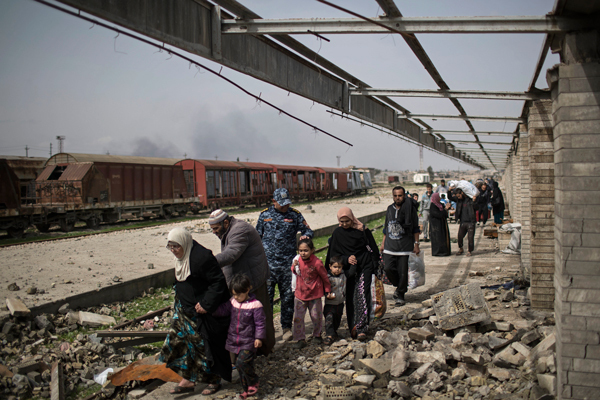 Iraqi civilians fleeing through a train station destroyed by U.S.-backed Iraqi forces and ISIS fighters in Mosul, Iraq, March 19, 2017. 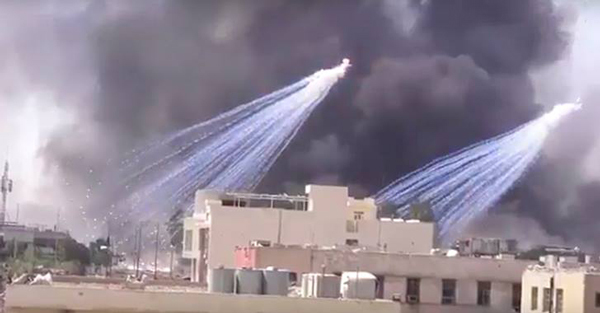 In recent days, U.S.-supplied white phosphorous munitions have reportedly been used in Mosul, Iraq, and Raqqa, Syria. White phosphorous munitions are savage weapons: they’re toxic, stick to the skin, and burn so hot they can create deep second- and third-degree burns. Under international law, they’re banned from use in populated areas. U.S. coalition forces firing white phosphorous munitions over Mosul, Iraq, June 4, 2017. On May 31, Islamic fundamentalist forces exploded a massive truck bomb during rush hour in central Kabul, Afghanistan, near a number of embassies. At least 90 were killed, and over 300 wounded—reportedly mostly (if not all) civilians. Across the region Islamic fundamentalist forces target civilians for attack as part of their barbaric strategy. One example, on May 30, ISIS exploded a car bomb in Baghdad, Iraq, killing at least 15 people who had gone to an ice cream parlor to break the fast of Ramadan. 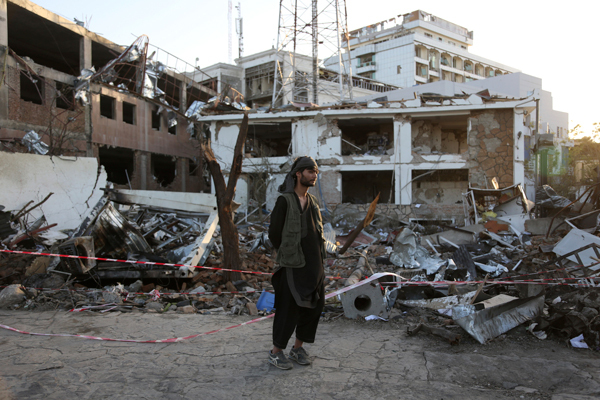 Aftermath of May 31 bombing in Kabul. 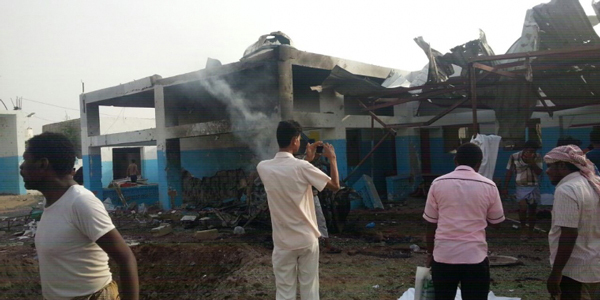 Doctors Without Borders-supported Abs Hospital in northwest Yemen after being bombed by Saudi Arabia on August 15, 2016. At least 11 were killed, and 19 more wounded. Read, study, and spread these quotes by BA―Bob Avakian, Chairman of the Revolutionary Communist Party, USA. This system of capitalism-imperialism has been built on, and continues to perpetrate, slavery and white supremacy and all manner of atrocities against Black people, other oppressed peoples, and the masses of humanity throughout the world, including the half of humanity that is female. Some claim that the answer to this is Islam, and in particular fundamentalist Islamic jihad. But that is not the answer—it is not a radical alternative to this system and its monstrous crimes—it is itself another form of enslavement, oppression, and atrocity, against women and the masses of people overall. The answer is an actual revolution—a really radical and emancipating revolution—communist revolution, to bring an end, at long last, to all oppression, everywhere.